What kind of car will it take to excite the digital native generation? And how is Nissan designing such a vehicle today? Teatro for Dayz is a combination of mobile technologies unlike any previously imagined in a car. Combined with Nissan’s EV technology, this car represents a radical new way of thinking about how vehicles can be used. Call it a vehicle. Call it a hi-tech device. Call it the lifestyle driver of the future. Owning a car was once a kid’s greatest aspiration. Having a driver’s license confirmed adulthood, and driving symbolized freedom to go where you wanted to go, when you wanted to go there, and to do what you wanted to do. But the generation that went straight from the cradle to the Internet and on to an ever-expanding universe of mobile devices holds different values. Sasaki calls this generation “share natives.” For share natives, excitement comes not from ownership of material objects, but from using things to connect with friends and share enjoyment. Through repeated sampling of next-generation customers, Nissan began to form a symbolic picture of share natives. Friends dressing in costumes and going out together…Taking pictures of the experience and sharing them…Playing games, connected to countless friends in a virtual world no matter where you are…Changing smartphone wallpaper on a whim…Online parties where the faces of social media friends appear. Nissan’s research indicated that minicars will be the vehicle of choice for share natives. “In addition to being compact, minicars remind them of the handy mobile devices they carry in their pockets,” says Sasaki. EV technology is a must for this generation. “Share natives are already accustomed to recharging their devices at home, so EVs fit their lifestyles far better than cars that require regular visits to a gas station.” With a driving range ample for short commutes, Teatro for Dayz can serve as a giant mobile battery, which can be used anywhere to recharge mobile devices. Bringing together observations of share natives’ interests and lifestyles with Nissan’s technological strengths in EV technology and insights into how the future of car technology will unfold led to the development of the first car for the next generation of drivers: Teatro for Dayz. From concept to interior and exterior design, Teatro for Dayz is simple: a clean canvas. When the car is in drive mode, meters, controls and maps appear on a pure white instrument panel. When parked, Teatro for Dayz transforms into an entirely new device. The entire interior, starting with the instrument panel, becomes a live display for a generation wired for connectivity. Teatroderives from the Italian word for theater. It is easy to picture share natives making Teatro for Dayz the center of an impromptu outdoor festival, or embarking on serious new-generation gaming fun complete with top-quality sound. Share natives could change Teatro for Dayz’s interior design, matching the look to the season, the weather, or simply the vibe of the day. Some might choose to share a dreamy scene with close friends far away. Others might decorate for an online party and share the moment with friends. Teatro for Dayz’s plain exterior, too, serves as a canvas for ideas. It’s outfitted with LED screens that enable further self-expression. Any experience in or around the car can be shared instantly via an onboard camera. All the while, the EV battery keeps smartphones and other devices juiced up. Teatro for Dayz’s user interface is based on freedom. When the car is not in drive mode, all the driver sees is a steering wheel, an accelerator and brake pedals. As information illuminates on the white instrument panel, the driver can freely adjust the size and position of the meters, gauges and car navigation information on the instrument screen. Unnecessary information can be hidden. The solid white interior suggests infinite possibilities for display. As technology evolves and share natives contribute ideas through feedback, the variety of ways the interior could serve as a digital native theater will expand. Teatro for Dayz will start a new conversation about the function of vehicles. We invite you to experience it at Tokyo Motor Show 2015. Nissan Motor Co., Ltd. is exhibiting a surprising concept called Teatro for Dayz at the 2015 Tokyo Motor Show. 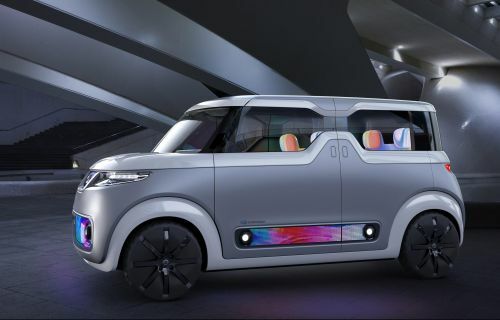 This is the first car designed specifically for the generation known as “digital natives.” Teatro for Dayz is more than a car for a generation of consumers accustomed to transformational technology and the freedom to use digital devices for sharing experiences. It is an out-of-the-box concept that defies convention and rejects restrictions. Teatro for Dayz’s concept is “a clean canvas.” It’s about being able to freely create and share experiences. The entire car serves as a platform for inspiration, allowing share natives to design their own experiences, connect with friends, display an attitude and freely share them. Have a passion for driving? If so, you’ll be forgiven if your first reaction to Teatro for Dayz is, “Is this really a car?” After all, all you see inside the interior are solid white seats, a steering wheel and two pedals. This is the “Future Canvas” interior concept: the appearance can transform according to your whim. Image display technology supports this concept—turning seats, headrests, door trim and the instrument panel into a moving screen. At first it may be surprising to see only a steering wheel and a flat instrument panel, but in this interior space conventional knobs and switches would limit display arrangement and expression. That’s why Nissan adopted voice control and motion sensors for the air conditioning and audio systems. In drive mode, meters and car navigation data are displayed on the instrument panel. When parked, it all disappears. Seats with bases that resemble balance balls feel radically different from the usual grip of a car seat, further signaling a departure from the conventional. With an exterior color scheme of satin white silver between full gloss white, the vehicle resembles leading-edge handheld technologies and provides share natives even more space for design creativity. Teatro for Dayz’s simple, square design maximizes possibilities for communicating and sharing, both inside and out. The wide, open interior provides the perfect space for friends to gather, while the plain exterior features LED screens that enable further self-expression. Overall, the unusually simple exterior design creates a compact and grounded impression, with cleanly rounded roof and bumpers, wheels extended to the outer corners and radically short front and rear overhangs. Teatro for Dayz—inside and all around it—is a canvas for individual expression. “How will share natives express themselves with this car? Just wait and see. They’ll share their first experiences on social media,” says Tai. Expect this unique concept born from the hearts and minds of tomorrow’s drivers to create ways of enjoying cars never before imagined. “Digital natives” is the name given to the generation now approaching driving age. Growing up with the Internet and connected 24/7 by digital technology, this generation relates to friends, information and technology in ways their parents’ generation never imagined. These are the future customers for the automobile industry. But what kinds of cars will they want? Will they even want cars? 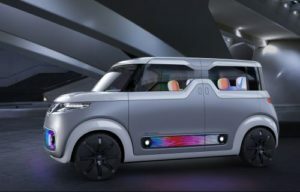 Visionary concepts like Nissan’s Teatro for Dayz, on display at the 45th Tokyo Motor Show 2015, are a starting point for understanding the future with share natives. Internet use has reached critical mass in different countries at different times. In Japan, for example, Internet penetration was just 13.4 per cent in 1998. By 2003, the rate had reached 64.3 per cent This was the beginning of the share native generation. Home Internet availability transformed the way this generation played. Consider video games. In the 1990s, portable game devices and 3D home video games were all the rage. High-speed internet connectivity changed everything; it enabled children to play games with friends who were in the next town or even in another country. Play became synonymous with connecting and the line dividing friends from strangers with common interests began to disappear. Following fast on the heels of the Internet was the ubiquitous spread of mobile phones. In 1999 mobile phone penetration reached 67.7 per cent. Four years later it had increased to 94.4 per cent. Smartphone growth was even more explosive, expanding from 9.7 per cent in 2010 to 62.6 per cent in 2013. As mobile phones rapidly evolved from a technology only for adults to something every child had to have, share natives skipped over the experience of home (landline) phones and shared family PCs and went straight to full-time personal connectivity. By this time, blogs and SNS were part of everyday life. While adults wrote blogs on desktop PCs, share natives used their mobile phones to post and share their photos and experiences on social media. The greatest difference between share natives and previous generations is their engagement with information. Older generations received information through traditional media, such as television and newspapers. The experience was top-down and one-way. The Internet turned information into something people search for. It’s interactive and user-controlled. To a share native, search is natural. The Internet is an ocean of information that is borderless and overflowing. Share natives feel at home in this environment, naturally moving from place to place, always discovering new things and satisfying every curiosity. Most information is free, so the question of cost rarely arises. Yet in this rapidly expanding ocean of information, it is challenging to find exactly what you need. That’s why share natives connect with others who share their interests, whether it be real world friends or people they know only online. Share natives are perfectly comfortable having meaningful relationships that exist only online. Today information is shared immediately. And information shared with one person can very quickly be shared with others. Share natives have no reservations about sharing friends’ posts with strangers or receiving information from someone completely new. For share natives, connecting and sharing is daily life. Smartphones make the experience even more immediate. From the time they could walk, share natives have used handheld digital devices. As a result, their communication is often in shorthand. A single word, emoji or emoticon often says it all. This generation’s acronyms, abbreviations and symbols are ever-changing and indecipherable to older generations. Armed with smartphones, share natives can communicate a full range of experiences and feelings without speaking or typing a single word. Even enjoying photos and videos is different for this generation. Since everything is shared on social media, enjoyment is derived not from the private moment of viewing images, but from the public experience of sharing them. By posting pictures of friends in costumes, selfies and videos from parties and events, share natives find likeminded friends. Everything is shared immediately, and the experience is borderless. Games and smartphone apps have expanded the experiences of the virtual world and made them all more immediate. Even during brief breaks, share natives update their statuses and play games, and sophisticated maps and GPS functions are rearranging the sense of virtual space in the real world. Phones were initially designed for one-on-one communication, but smartphone apps now allow group conversations. Most of these services are free, so share natives can sit in their own space, chatting with friends from around the country as easily as a previous generation might have gathered for a neighborhood party. What share natives value above all else is being connected to friends. Older generations may shake their heads at the sight of kids absorbed in their smartphones, but this is how life is experienced for them. Nissan grappled with the question of what kind of car would appeal to share natives. One concept is Teatro for Dayz: a platform from which share natives can play, create, communicate and share experiences. For everyone, regardless of age, the excitement of vehicles lies in the experience. Until now, Nissan has focused on vehicle experiences familiar to anyone born in the 20th century: driving somewhere new; basking in luxury; exploring driving passion; brisk acceleration. With Teatro for Dayz, Nissan has designed a car just for share natives. Representing both a radical departure from the past and compelling vision of the future, this concept is a canvas from which share natives can create and share experiences. As a platform for imagination and free inspiration, Teatro for Dayz will be the first car to excite the hearts and minds of the next generation of drivers.